Zach Joens, Bulldogs’ forward. Photo courtesy of UNC Asheville. Moore’s prediction came to fruition on Saturday when the Bulldogs beat Liberty University 4-3, making them 2-0 and at the top of the Big South conference. The Bulldogs struggled in the first half against Liberty, getting behind 1-0. 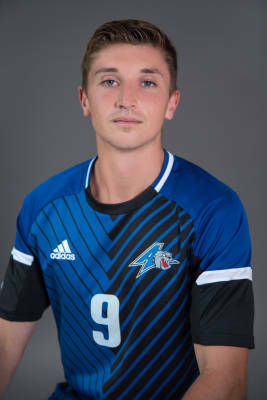 Zach Joens, a forward for the Bulldogs, scored in the 60th minute to tie the match. The two teams filled the second half with a series of goals. Liberty took the lead again, then UNCA scored two to earn its first lead of the match. The game was close to heading into overtime due to an 86th minute tying goal by Liberty, however Joens’ corner kick in the 89th minute connected with Lawrence who headed it in to win the match.